We made half with Jalapeños and half without for the kids. Then all you do it top with sour cream and guacamole. Chop bell peppers and garlic finely. Sauté in oil until soft. Place in a bowl and let cool for a while. Add jalapeños, spices and both cheeses. Mix well. Cut partway, lengthwise through, along the thinnest part of the chicken so that you can open it like a book. Place a big dollop of cheese batter and close with a tooth pick. Salt and pepper. Fry golden in oil or butter. Place in a baking dish. Bake in oven for 15 minutes or until the chicken breasts are thoroughly cooked. Remember to remove the tooth pick before serving. Serve with leafy greens, a generous amount of guacamole and sour cream. Add tomato, olive oil and finely chopped cilantro. Salt and pepper and blend well. So this is actually partially a recipe from my family cookbook Frankensteined together with the way Ruby River Steakhouse makes their Smothered Chicken. 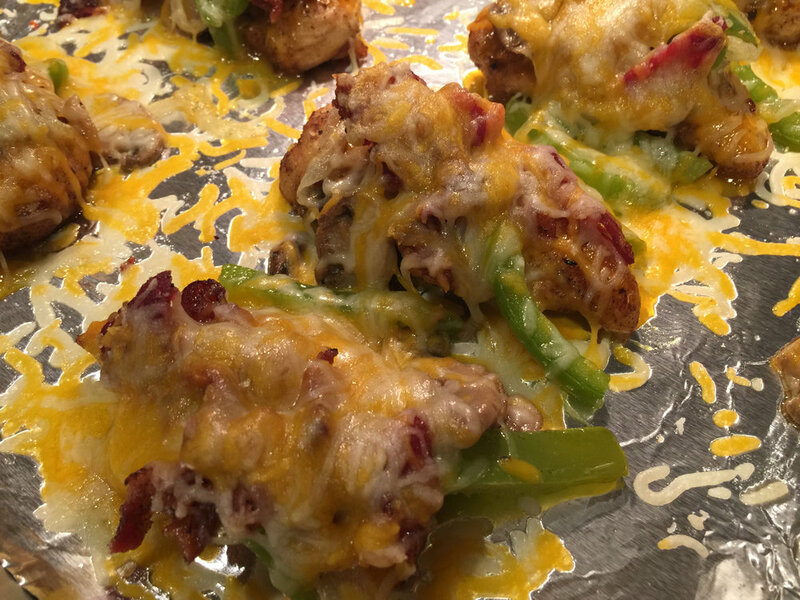 My husband Brandon and I fell in love with the Ruby River Smothered Chicken back when we first got married. We could not find the recipe for it anywhere so we decided to put a few really close recipes together and It turned out even better than we had hoped. Preheat oven to 350° to get it heated up. Start by cooking bacon in a pan. You will use this same pan to cook the chicken. After the bacon is cooked set it aside. We used maple smoked bacon and it gave it amazing flavor. Now thoroughly cook the chicken in the bacon drippings. This will give your chicken amazing flavor. I used chicken tenders instead of chicken brests because the portions are a better size for my smaller children. At the same time, you are cooking the chicken you will start sauteing sliced onion, sliced green pepper, and mushroom in butter. You can also salt and pepper it to taste. When the chicken is cooked and the veggies are all sauted you can move on to the next step. To make the honey mustard glaze you will heat the honey and mustard in a pan on medium heat until the two ingredients mix. Place chicken on a baking sheet. Now drizzle the honey mustard glaze over the chicken. Now top chicken with the sauted veggies, and the bacon you cooked earlier. Top with cheese and put in the oven at 350° for 10 min until it is warmed through and the cheese is melted. Take out of the oven and serve. The flavors of the chicken, bacon, honey mustard glaze, and veggies are amazing. I hope you get a chance to make this. It is so yummy and it smells as good as it tastes. Enjoy! Let me know how you like it in the comments below.